The Clos Windsbuhl is our biggest single vineyard: slightly above 6ha, in one piece, on a homogenous old calcareous soil, overlooking the village of Hunawihr on a south to east exposure. 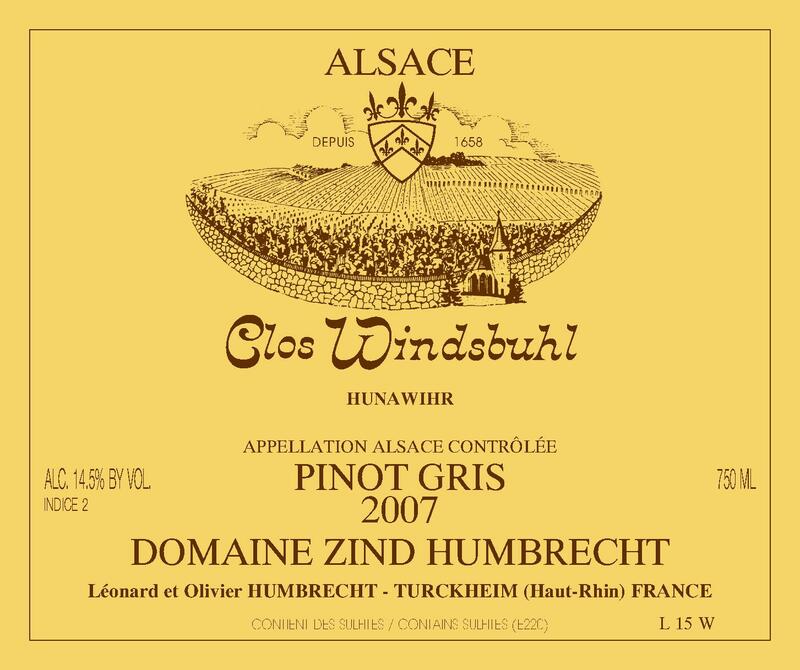 The good drainage quality, high lime content and higher altitude made us think that Pinot Gris should also grow greatly in the Windsbuhl. Today, there is 2.5ha of Pinot Gris, out of which half of them are old vines, which are used to produce this wine. The 2007 vintage was a low botrytis vintage for the Windsbuhl. Pinot Gris usually allows for massive botrytis development if harvested late, but the dry and cool weather conditions of 2007 stopped the noble rot. Interestingly, the older vines showed less noble rot than the younger vines, mostly because the crop was smaller and the vines less vigorous. After a very long fermentation (the longer in 2007 after the SGNs), this wine eventually finished as dry as possible. 12/2008: watching this wine fermenting was like watching a movie in slow motion! Many times we thought that it would stop, keeping a lot of sweetness. Eventually after 12 months of activity, the result is a powerful, high acid, long mineral wine. Both the nose and palate show toasted, tea leaves, chalky and some fruits flavours. Quite hard to describe, but very intense and complex. This isn’t a classic semi dry style wine. The finish appears to be drier than the residual sweetness would suggest. Eventually, this wine will become a fantastic food wine.